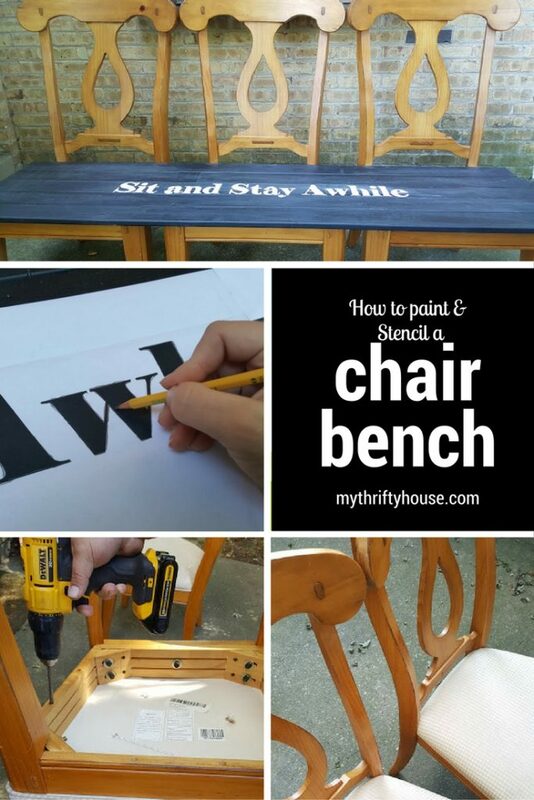 Today I am excited to share how I made this awesome chair bench with 3 dining room chairs because that’s what you do when you are missing the 4th chair. When you get to the bottom of this post you will be treated to some serious creativity so please make sure you visit the Farmhouse Hens and get to know us. My chair bench was made from 3 dining room chairs that were gifted to me by my friend Liz. She has a cute little junk shop in town but “little” is the keyword here. These big chairs were taking up a lot of room in her cute shop and she just didn’t have the time to do a project with them so she kindly gifted them to me. My first rule of thumb with wood furniture is to paint it if it is heavily scratched or damaged. 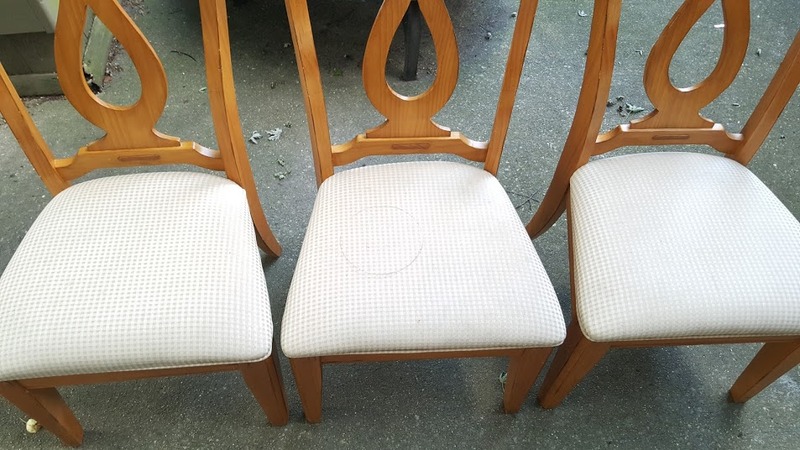 These wood chairs were in pretty decent condition other than the stained seat cushions and I opted to not paint them at the moment. 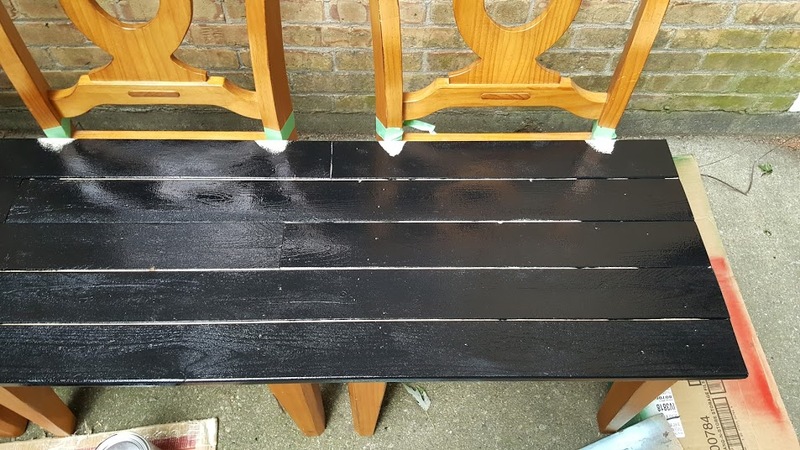 After my hubby removed the stained chair cushions, he shimmed the chairs together and added some 1 x 4 boards across the three chair frames to make the bench. 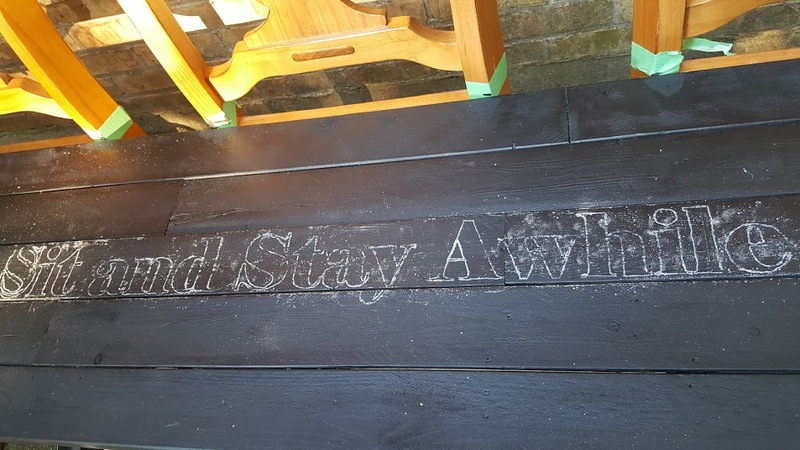 I painted the bench seat with 2 coats of flat paint and decided that I wanted to stencil a saying across the seat. Since the surface was a dark color the stencil transfer was going to be a bit more challenging as I couldn’t use graphite paper. 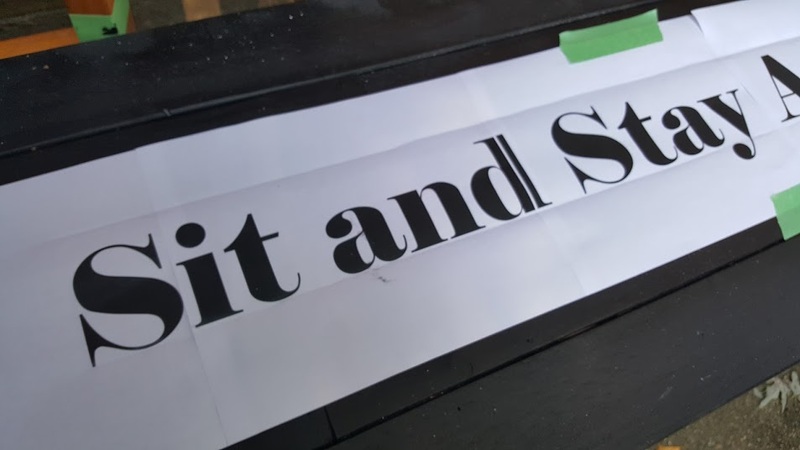 I printed my saying using a banner template on Microsoft Publisher and rubbed the back of the paper with a piece of chalk. After I centered my banner on the bench I taped it using painters tape. 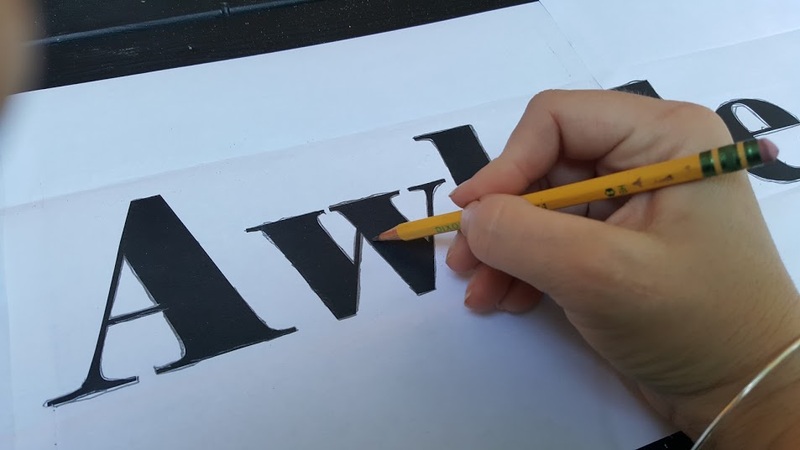 Then I took a pencil and traced around each letter on the sign which then transferred the chalk outline onto the chair bench seat. Then I took some of my homemade chalky paint and filled in the transferred chalk outline. I have to disclose that I do not have a steady hand and I am the worst at painting details. Probably explains why I am so drawn to the chippy, shabby imperfections of the farmhouse look. After I painted the letters I lightly distressed the bench with some sandpaper. 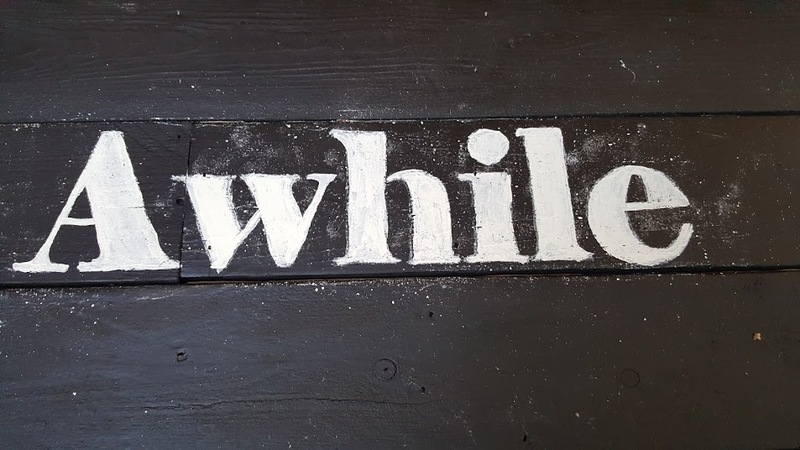 Since my saying is “Sit and Stay Awhile”, I wanted it to look like the words had been there for some time and many people have enjoyed sitting on the chair bench. I really do like the completed chair bench but I am going to be giving this bench to a friend and she can let me know if she would like the chairs painted or left as natural wood tone. Stay tuned, this might not be the end of this project. Also, don’t forget to keep scrolling and visit the other Farmhouse Hens and all of their beautiful bench projects. This entry was posted in Furniture Facelift, Thrift Store Decor Challenge and tagged furniture, recycled, repurpose. Love it, Denise!! It came out great! Thank you Kellie….glad you like it. Love it!!! Your bench turned out so cute! This is really awesome!! And you’ve done such a GREAT job! Thank you Winnie…I kinda like it too. So adorable and welcoming! Nice job! Great idea! 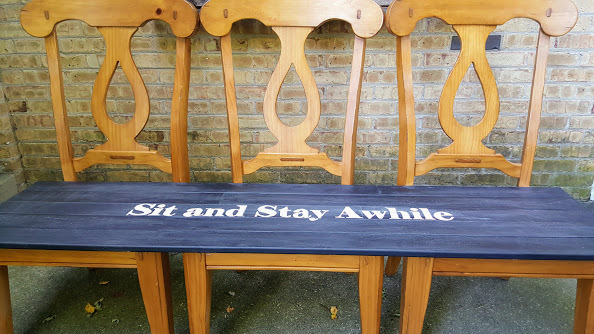 Now more people can sit and “stay awhile”! Visiting from Thrift Store Upcycle. I will now be on the lookout for some chairs to turn into a beautiful bench. I love the stenciled message, it’s so welcoming. Beautiful job friend! This is so FUN! What a great space saver and it looks perfect. Thank you so much for sharing. Pinning. I’ve seen chairs made into benches before and I think it’s such a clever way to create some new seating. I love the stencil quote you chose too. What a great idea! Forget about upholstering so many chairs! You did a beautiful job. Chair benches are so much fun. This is amazing!! The saying really adds such a great touch! Just love it! This is so fun and I really, really love the little saying that you painted on the bench seat. Too cute! I love how this came together – it’s so welcoming! Love it! What a clever idea!! Perfect for an entryway. Super cute entryway! Great use of old chairs. Love it! Oh my goodness! I need one of these benches on our front porch. Such a cool project! Love that you got the chairs for free and the saying you wrote on it! This bench is great because of the backs. This is perfect for an entryway. Love the saying.